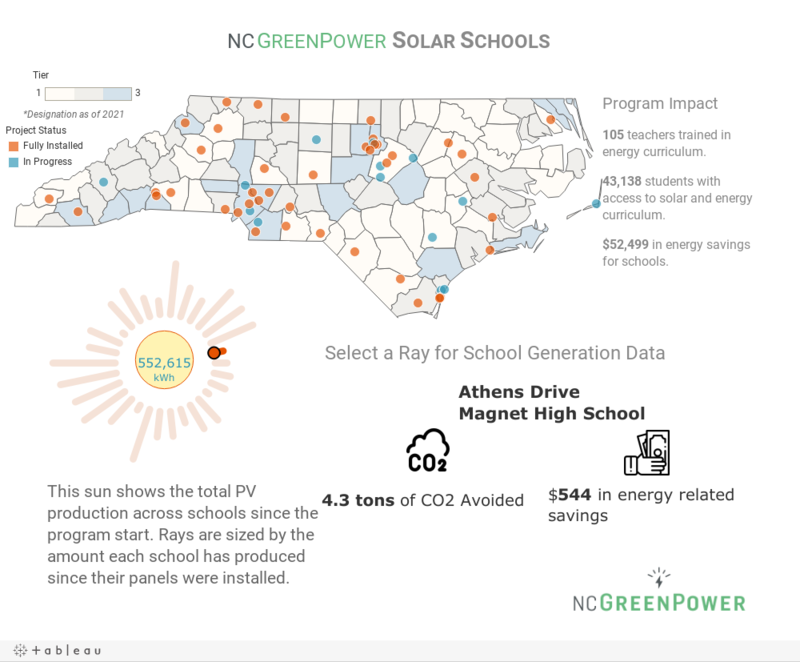 NC GreenPower is pleased to announce Solar Schools, providing matching grants for 3-5 kW solar educational projects at schools, complete with a weather station, real-time monitoring, curriculum from NEED.org and training for teachers. Any K-12 school in North Carolina may apply for a 50% matching grant, up to $10,000, and NC GreenPower will assist the school with raising the balance of funds required. To make a donation to a specific school’s campaign, contributors can go to our fundraising website: my.NCGreenPower.org. We are also pleased to be partnered with the State Employees Credit Union (SECU) Foundation, offering up to $15,000 as part of a matching challenge grant to select public schools, increasing their system to 5 kilowatts. Donate today! TO SIGN UP FOR UPDATES REGARDING NC GREENPOWER SOLAR SCHOOLS, VISIT THIS PAGE. The application period for the 2019 year is now closed. Grant recipients will be announced mid-May. TO SIGN UP FOR UPDATES REGARDING NC GREENPOWER SOLAR SCHOOLS, VISIT THIS PAGE. Questions should be emailed to solarschools@ncgreenpower.org. Submitted questions and answers regarding our Solar Schools program can be found here in our FAQ section. Need help convincing your school? Download this “Why your school should apply” document for some great reasons. The application period for pilot year four is closed. Questions should be emailed to solarschools@ncgreenpower.org. Submitted questions and answers regarding our Solar Schools program can be found here in our FAQ section. Need help convincing your school? Download this “Why your school should apply” document for some great reasons! The NC GreenPower Board of Directors’ review committee met this spring to evaluate applications and make selections for 2018’s pilot program. Submitted questions and answers regarding our Solar Schools program can be found here in our FAQ section. * Applications are no longer being accepted for the 2017 Solar Schools pilot. Questions should be emailed to solarschools@ncgreenpower.org. We are pleased to announce that solar schools awarded in the second year of the pilot have successfully raised their funds for a 5 kW solar PV array to be installed at their school! We want to thank all the donors who contributed money to the schools through our fundraising website or by other means. Duke Energy, through Raleigh-based nonprofit NC GreenPower, announced that it would pay $300,000 to install a solar power system at eight North Carolina Schools. The program will spur the generation of more clean energy, while creating a learning environment for students. Any K-12 school served by Duke Energy Carolinas could apply. Consideration was given to schools that had expressed past interest in solar, schools in economically challenged Tier 1 counties and schools in Mecklenburg County. Modeled after NC GreenPower’s Solar Schools program, this particular initiative will pay for 100 percent of the installation costs for rooftop or top-of-pole mounted systems on school property. The program also provides monitoring equipment, training and curriculum to students and teachers. NC GreenPower will administer the program in conjunction with and in addition to our own statewide Solar Schools pilot program. More information can be found here. The program is part of a recent settlement with the U.S. Environmental Protection Agency and environmental groups. * Applications are no longer being accepted for the Duke Energy Grant. Questions should be emailed to DEschoolgrant@ncgreenpower.org. Huge thanks to the State Employees Credit Union Foundation for their matching challenge grant of $10,000 for each of our 2015 pilot schools! We are pleased to announce that solar schools awarded in the first year of the pilot have successfully raised their funds for a 5 kW solar PV array to be installed at their school! All 2015 NC GreenPower solar schools have received their $10,000 grant from NC GreenPower and a matching challenge grant of $10,000 from the State Employees Credit Union (SECU) Foundation. We want to thank all the donors who contributed money to the schools through our fundraising website or by other means.